Julie Golob’s enthusiasm and frequent bursts of laughter during conversation are two of the endearing qualities that make her an appealing person to be around. Combine that with her impeccable qualifications as a competitive shooter, and you can see why she’s a sought-after ambassador to the shooting sports. Golob’s initial exposure to shooting was conventional enough; her dad would take her to the range. But what set the two apart from the usual “parent-teaches-child” tradition was her father’s interest in action-shooting sports. Julie Golob is an accomplished competitive shooter with more than 130 shooting championship titles that span the world. “My dad was really big into a bunch of different shooting sports, but mostly USPSA/IPSC kind of stuff, but he did a little bit of silhouette and precision pistol and stuff like that,” recalls Golob of her early days on the range with her dad. That early exposure to the “sport” side of the shooting sports took hold, and the two were a frequent duo seen on the range. “We became this father-daughter range officer team. We worked a lot of the local matches, and we traveled around,” says Golob, adding that, though he started taking her to the range when she was “very small,” it wasn’t until she was 14 when she actually started shooting with him. While other young girls of the 1980s may have aspired to be like prominent women of the time such as First Lady Nancy Reagan or Prime Minister Margaret Thatcher, Golob admired heroes such as professional shooters Rob Leatham and Jerry Miculek. “I got to see them in action at all of the premier championships, and I knew I wanted to be like them,” she tells me. And she has become like them. Golob’s list of accomplishments includes everything from U.S. Army Athlete of the Year for her shooting ability in the Army’s elite Marksmanship Unit to more than 130 shooting championship titles that span the world. 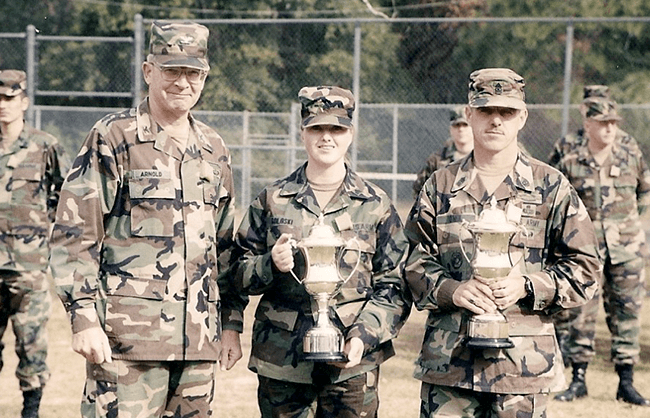 Golob was presented with her Open and Limited National trophies in front of the U.S. Army Marksmanship Unit formation. As significant as that one gun may have been to her future, Golob hates being asked what her favorite gun is, because it depends on what she’s doing. Golob started in action pistol shooting sports but has since branched out into other disciplines. When not shooting competitively, Golob says she likes being surrounded by her family, working with her hands and doing renovation projects around the house. When not competing, Golob enjoys spending time with her family outdoors. In addition to helping new shooters, Golob authored a book on how to get into shooting. To the aspiring shooter, Golob says you need to take in protein and fat to make sure you have enough endurance to last a day of competing, and she suggests natural sugar from fruit or something like that if you “need a little pick-me-up.” She calls sleep and hydration “probably the most significant components” of competing, but says those are hard to control if you’re nervous going into a competition. Her best advice, though, is to simply get involved. 1. Julie raises chickens and once had a rooster she named Genghis Khan. 2. She’s handy with power tools and likes to build things. 4. She plays the French horn and was in the New York All-State program. 5. Before a match, Golob used to buy M&Ms and eat only the orange ones. 6. Golob likes her quiet time. 7. Golob has carried a gun on her hip on six continents and says if she can find a way to get to Antarctica, she will have every one checked off.